How is TR-10i powered? Does it require batteries? TR-10i uses a USB connection to power and transfer information. You don’t need any batteries! How is TR-10i different from other Internet VoIP phones? Change from a hands-free speaker to a personal handset at the flip of a switch. Have long conversations or conferences in hands-free mode; when it gets personal, simply switch to handset mode. Focus on what you have to say, not what you use to say it: the TR-10i’s advanced echo cancellation through its DSP chip limits background noise for crystal-clear sound quality – wherever you have to take that call. Benefit from one-touch recording with easy-to-use included software, providing you with a unique tool to record iChat conversations, create voice memos, and later email them to friends or coworkers so that you can make sure you never forget a thing. The buttons/dial keys do not work. If you are using the IPEVO Control Center software or iChat, please update it to the latest version. If you are using other programs you can use the TR-10i speaker and microphone but you cannot use the keys. The microphone doesn't work in speakerphone mode, though it works in handset mode. Download and install the latest version of the software, IPEVO Control Center. Run the IPEVO Control Center. Select TR-10i as your input and output from the drop-down menus. Launch your IM software. Try making a phone call. When on your call, watch the IPEVO Control Center. The Input and Output levels should be high/maximum. If not, adjust them to maximum. I can hardly hear the person I am speaking to. Do I need to make some changes to the settings? While the IPEVO Control Center is running, you can go to the Sound Settings tab and adjust the slider bar for the Audio Input and Audio Output to the desired volume level. How is TR-10i able to provide unlimited recording time, which is a feature of its recording function? What is the process involved in recording the conversations? The recording function in TR-10i works by using custom-made recording software to store the sound file on your computer's hard disk. Unlike most recording software that limit recording time from one to five minutes, the TR-10i allows you to record conversations of any length as long as there is enough storage space on your computer hard disk. Sound files are stored in WAV format to preserve the original sound quality, which the user can convert to different formats to keep the size of sound files to a minimum. I've downloaded the Mac software, yet when I go under the "About" section of the IPEVO Control Center, it shows a version different from what I saw on the web. Please refer only to the IPEVO Control Center version number. We also think it's a bit confusing, so we'll be aligning our numbering system very soon! How do I use my TR-10i with Xlite, iTunes, or other non-iLife programs? Will the buttons work? 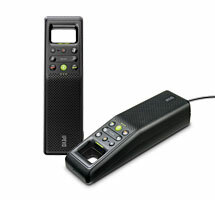 TR-10i has been designed to be used with iChat, and includes buttons to access iChat’s features. TR-10i also works well as a high quality communication device compatible with other VoIP software, and the speakerphone, microphone, recorder and volume buttons will function as normal - simply select "IPEVO microphone with FreeRec" in the input preference of your software. However, the iChat-related features (Launch iChat, Accept incoming calls, End current calls, Mute) and the buttons to access these features will only work with iChat. Can I use TR-10i in non-Skype applications? Since TR-10i is optimized for use with Skype, most of its keys work only with Skype. However, its microphone and speaker functions, along with the recording feature, should work with any applications. What is the range of the microphone? The embedded microphone has a range of a full 360 degrees, with a radius of 1.5 square meters. What Operating Systems are compatible with TR-10/i? Windows: XP, Vista, and Windows 7 32-bit versions. The 64-bit versions should work except for the recording function, though we do not officially guarantee compatibility. Mac: OS X 10.4 - 10.6. What is the difference between one-way and two-way sound recording? Two-way recording: Captures both sides of the conversation. You can use this feature for recording your phone conversations or conference calls. It is effective not only for Skype-to-Skype calls but for calls between landline or mobile numbers. One-way recording: Captures only your own voice. You can use this feature for creating your podcast and customized voicemail welcome messages.